Buying a piece of used equipment can be a lot like buying a used car in that your experience is likely to be very different — good or bad — depending on who you’re buying from. At Volvo, our Certified Used machines are inspected, tested and/or reconditioned under strict guidelines; but there’s no industry standard for how inspections, documentation or condition reports are done — so it varies. If you’re new at purchasing used equipment, or if you’re just curious about what to look for during a used machine inspection, here are some tips and red flags that can help ensure the used equipment you’re buying won’t be headed for the shop sooner than you expect. Wear Components and Life Cycles: Before looking at the machine, it’s important to identify all the various wear components in the type of machine you’re purchasing. You’ll also want to review a condition report (equipment dealers typically provide them; auctions don’t) to determine the life cycle of those components and where they stand. If you’re purchasing a large used wheel loader with 8,000 to 10,000 hours, for example, and it’s never had transmission work done, you’re pushing the life of that component. There’s a good chance you’ll be buying a transmission while you own it. Previous Worksite Conditions: Ask how the machine was used, where, and in what kind of working environment. In sandy places like Florida, undercarriages may last less than half of what they do in more inland states due to the wear of the sand. If a machine was used by a city or county to manage salt for icy roads, it’ll be exposed to more corrosion, especially in coastal areas. Waste and demolition applications put more wear on the tracks and tires. 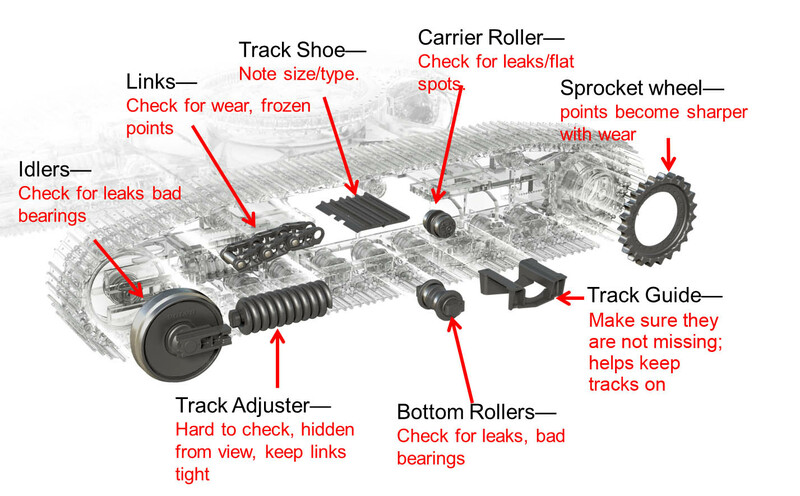 Knowing how and where the machine was used will help you better inspect specific parts and components with more anticipated wear. Recapped Tires: It’s pretty common to recap tires. Also known as ‘retreading,’ this is putting a new tread on a worn tire. Some companies do a nice job recapping and the tires perform well, but not everyone does, and it’s important to know that a recapped tire doesn’t equal a new tire. From a picture, it’s not easily noticeable. To spot a recap in person, you’ll typically see some type of line all the way around the ring of the tire. Tread/Sidewall Cuts: If you see some, determine if they’re superficial or serious. Use a tool like a depth gauge to measure how deep the cut is. It depends on the width of the sidewall, but a good rule of thumb is a cut that’s a quarter inch or more is likely a sign of a problem. This isn’t just a performance issue. In mining applications, you can be fined and/or required to replace tires with cuts. Oil Samples: Get an oil sample and check for metal contamination. An oil analysis will track microscopic portions of wear metals like iron, copper, lead, tin, aluminum and more. For a transmission, if you see high iron or copper content, there’s a pretty good chance there’s an internal failure somewhere. Undercarriage: If the sprocket teeth on an excavator are really sharp, they’re worn out. And if you see sprockets that are worn, there’s a good chance the bushing on the links are worn out as well, which you can tell if they feel flat — bushings should be round. Finally, if you’re seeing wear on the end of a bushing, that’s a sign that the bottom rollers may be worn and are rubbing on the bushing. Tracking: With a tracked excavator, pull it forward about 20 to 30 feet and then back it up to make sure it’s tracking in the same spot. 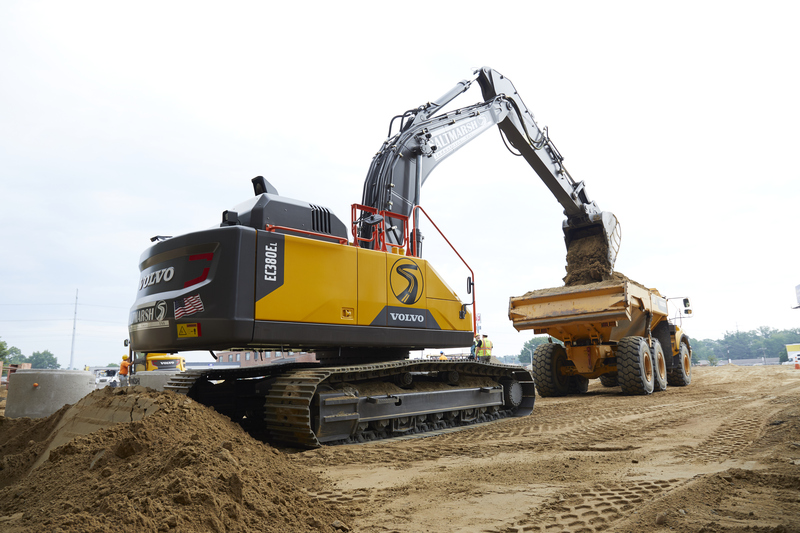 It’s not uncommon to see an excavator start tracking a little more to the right or left. If that occurs, an adjustment needs to be made. ROPS (roll over protection structure): Be sure to check for damage on all four of the corner posts. Make sure there are no welds and that no one drilled into them. It’s not uncommon, especially in mining applications, for people to mount CBs by drilling into the ROPS. If the ROPS is drilled, welded or otherwise damaged I consider its structural integrity to be compromised, which means in the case of a rollover the ROPS may fail, possibly leading to injury or worse. Seat: Make sure all seat adjustments work to ensure it will operate comfortably and safely for all your operators. Buckets and Blades: Look for wear and cracks. You can also pick the bucket up and flip it over and look at the bucket floor for dents, cracks and wear. If the bucket has teeth, make sure they haven’t been worn down to a U shape. Hoses: Hydraulic hoses can get pretty expensive, so it’s important to check the fitting on the hose to make sure it’s not corroded. While you can’t know internally if a hose is going to blow, you can visually inspect the outside to make sure there isn’t any part where it can rub. Also, take the time to check for any possible leaks. Use these tips and inspect your next used equipment purchase like a pro. And to make purchasing used machines less of a gamble, Volvo has high-quality used equipment to help you tackle any job. We also recently rolled out our Volvo Certified Used program where we inspect and repair the machines, and their condition is certified by us. That means you know exactly what you’re getting. Search our full inventory today.